The 2018/2019 Tecnica Cochise 85 W was tested in the women's On-Off Area medium width category at Silver Mountain Resort by the experts at America's Best Bootfitters, powered by Masterfit. Of the 2019 Tecnica Cochise 85 W, one tester said: "You feel like a cool kid with it on." We figure that's good enough for us. While it was entered as a Soft-Value entry the cool kid still managed to beat up on half the medium-width, On-Off Area class and received the second highest grade of all Soft-Value entries with hike modes. What do testers like most about it? They like that everything fits and works as it should—no surprises, no compromises—and it's priced hundreds less than the others. 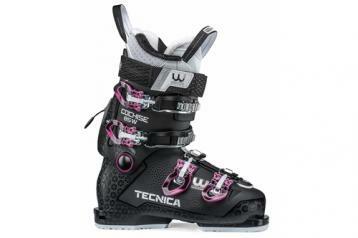 Testers said that the fit is luxuriant and easy-going for a medium width, though they felt that the heel and ankle were held well enough for fairly aggressive skiing. Testers also appreciated the slightly more open fit at the forefoot, over the instep and in the calf. The fit along the shin was described as ideally cushioned. Part of the reason that testers claim this boot skis as well as alpine boots is that it didn't give up alpine boot plastic to shave weight in the lower shell where it maintains polyether and polyester plastic construction. The metal-on-metal cuff release mechanism keeps a direct-drive feel on board, though testers liked how easily it made transitions from turn to turn. Testers were unanimously surprised by this boot's quickness and strength, calling it an 85-flex sleeper. The same Custom Adaptive Shape (C.A.S.) shell features found on the Mach1 boots are found here too. The shell is pre-dimpled in common work zones for better-formed and better-lasting heat stretches. The Ultrafit Merino wool liner was a hit with testers for its warmth as well as its cozy feel.